When you create a unit in your tracker, it will automatically appear in any curriculum map created from that tracker. First, open the tracker for which you would like to create a unit. Next, hover over the multi-colored button and then select Create New Unit. 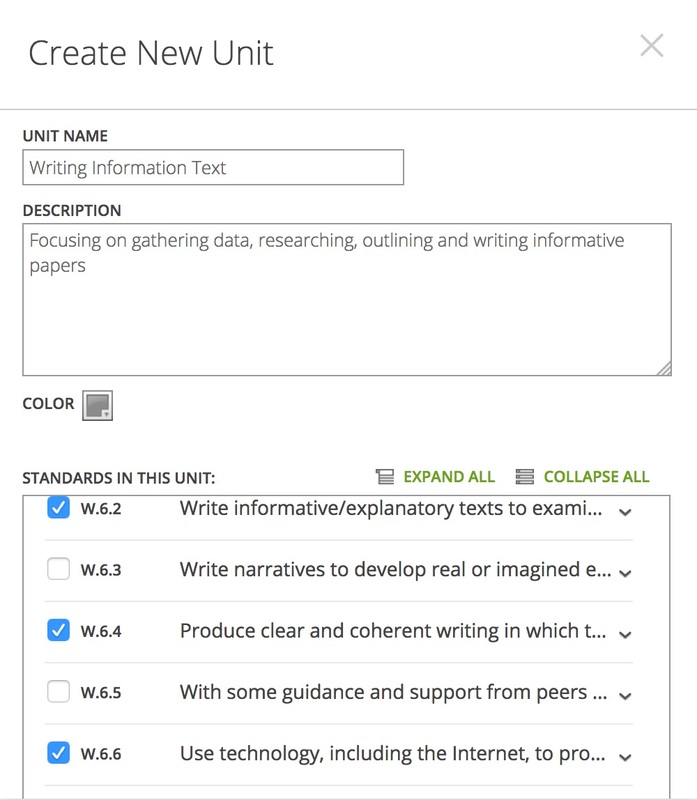 In the Create New Unit window, type a Unit Name and optional Description. You can also select a color; all standard headings for the unit will now appear in your tracker with that color. Select the standards that you're adding to the unit. When you're done, click the Save button to return to the tracker. You'll now be able to see the unit when you hover over the multi-colored button. To edit the unit at any time, hover over the multi-colored button and then select Edit. To hide the unit from the tracker, just clear the check box for that unit.